Solitaire was always an interesting game to play but it’s a bit awkward in some situations. Like when your boss walks in to check on your progress and sees your desk full of cards. Luckily we now have digital versions that can be quickly hidden. At this point there’s probably a lot of people that play it and don’t even own a deck of cards. I haven’t owned a deck of cards in decades. How does a ghost end up on the Moon? …On second thought, that’s probably better left unanswered. Also, whenever I get a deck of cards, it usually ends up losing a few cards, and thus unusable for most games. It’s no use playing poker when your Ace of Spades and 10 of Clubs are AWOL. 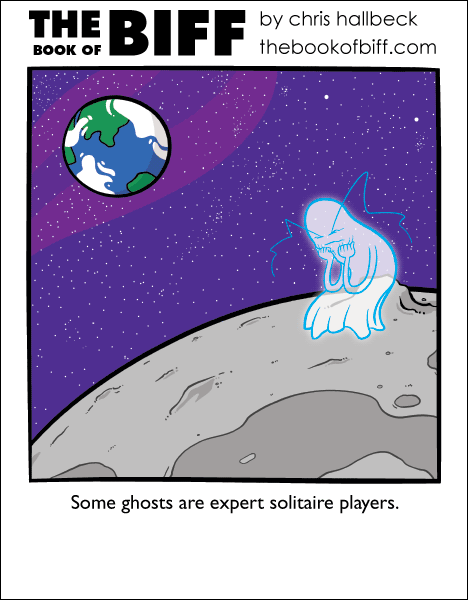 Have you heart of my new band, Ghost Moon Solitaire? we have decks of cards… I don’t know where they are.. but I know I own them. Did you know that computer solitaire was actually designed for the purpose of getting people comfortable with the mouse? Sudden urge to play solitaire for chance at success and **** YES CARDS BOUNCING EVERYWHERE. But I’m pretty sure you can get unwinnable setups and I hate when card games are determined regardless of the players. Falos: Some solitaire programs have a list of unwinnable seeds which they don’t use unless you choose an option to allow them. Another advantage to computer solitaire is you don’t have to shuffle your own cards. And the stacks never get knocked over. This comic for some reason reminds me of an old science fiction story I read quite a while ago. When men first left Earth, they found that they could think a lot faster and more clearly. There was some mental parasite that couldn’t live off Earth. Then they got to the Moon or Mars (I forget which) and forgot all about it since that ball of rock has its own. Onex – DUDE. WHAT WAS THIS STORY CALLED?! Also, why wouldn’t we just create space stations and live there? I know they got new parasites that otherwise probably made them incapable of realizing this, but did EVERYONE move to a new planet all at once and not leave any astronauts behind on ships or whatnot that were parasite-free? I prefer playing solitaire with real cards, computer solitaire hates me. No I’m not paranoid, seriously my win/loss ratios for the two are completely different. I have about a 1:9 win/ratio for the computer while the ratio for real cards is around 9:1. Computer Solitaire does hate me.